Do histamines in wine give you a headache? Do you have a histamine intolerance? Get the facts you need to know about histamines in wine in general and red wine and headaches in particular. 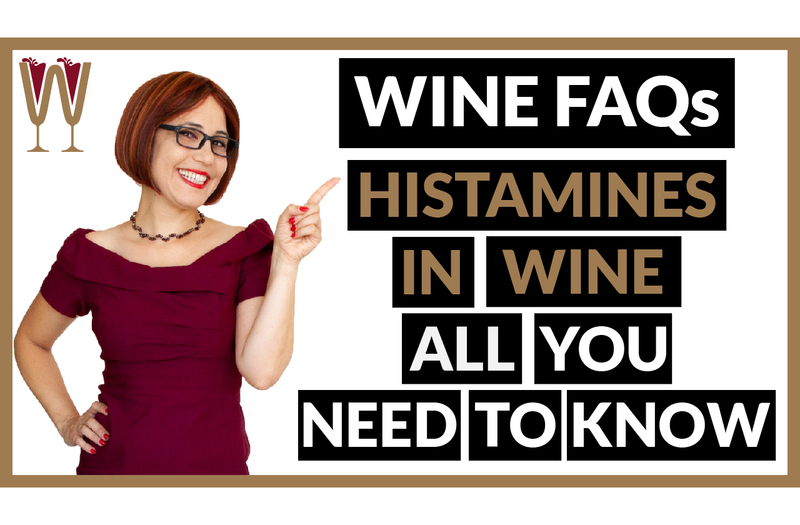 Find out all about histamines in wine side effects and get actionable tips on how to deal with histamines in wine! What are histamines in wine? Researching this topic was fascinating. Let me share with you everything I have found out about histamines in wine! And stick around till the end for a bonus tip that will help you counter a moderate sensitivity to histamines, without medication! So, histamines in wine. Let’s dive in! This sounds like a complicated topic, but we have boiled it down to Three Steps: the What, the Why and the How. That’s It! So, Step One: What are histamines anyway? Histamines are chemicals released when our body perceives something as an attack. They alert our immune system to the perceived danger by causing a massive inflammatory response that can include flushing cheeks, headaches, nausea and irregular blood pressure. Why are Wines High in Histamines? Step Two: Why are wines high in Histamines? There are natural histamine releasing bacteria on grape skins. The bacteria feed on grape sugar during maceration and fermentation, making wine a very histamine-rich food. How can we Deal with Histamines in Wine? Step Three: How can we deal with histamines in red wine? Does red wine give you a splitting headache? If so, you might be a member of the 1% of people whose body cannot process histamines very efficiently. How can you counter the effect of histamines and still enjoy wine? Did you know that red wine can have up to 200% more histamine content than white or rosé wines? If you really very sensitive to Histamines, then please, enjoy white and rosé wines. There are some beautiful complex tastes available if you are willing to expand your horizons beyond Sauvignon Blanc and Pinot Grigio. Don’t believe me? Check out our comparison of two less common white wine varieties, Xynisteri and Sultanina and find out which of the two pairs best with a Classic Chicken Caesar salad! The link to the video is in the description below. However, if you are unwilling to give up red wine – and we don’t blame you – then you might want to look into red wines that have been certified as low histamine wines. They have been specially processed to contain as little 0.5 micrograms per litre of histamines. For comparison, a red wine can contain between 60 and 3800 micrograms of histamines! Even easier than low histamine wines? Drinking loads of water of course helps keep your blood pressure even and washes away any build up of histamines in the bloodstream. Besides, water helps prepare your palate your next glass of wine. Whatever you do, please don’t take antihistamine drugs before a wine tasting. They often cause drowsiness, dizziness and even blurred vision. They are likely to ruin your wine tasting enjoyment worse than histamines. Are you ready for my top tip on how to counter the effects of histamines? Before your wine tasting events, enjoy a couple of cups of strong coffee. This is because whereas histamines dilate blood vessels, coffee has the opposite effect to histamines: it constricts blood vessels, thus countering some of your body’s reaction to histamines. So, Tasters, If you liked this video hit the like button below. If you would like us to continue making these videos please let us know by sharing with your friends. Subscribe to our YouTube Channel now. And remember, those who drink get drunk. Those who taste, feel sublime. I will see you on the next video.